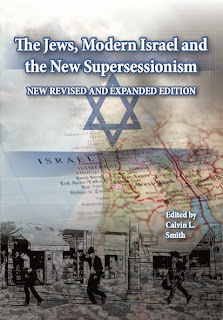 Calvin L. Smith: Review of "The Politics of Apocalypse"
Following on from yesterday's post about Christian responses to the Arab-Israeli conflict, here's a review of a useful book exploring Christian Zionism. While I don't agree with aspects of Cohn-Sherbok's argument, nonetheless he offers an alternative approach to Christian Zionism which, while critical, is somewhat less pejorative (and therefore more likely to engage its opponents constructively) than other books exploring the same topic. This review was posted on the King's Evangelical Divinity School blog in 2008. Dan Cohn-Sherbok. Oxford: Oneworld, 2006. Recent years have witnessed a notable scholarly interest in the instrumental role played by some Christians in helping to establish a Jewish homeland in Palestine in the late nineteenth and early twentieth centuries, which ultimately led to the creation of the State of Israel in 1948. From an Evangelical standpoint, Stephen Sizer in particular has expressed criticism of early Christian Zionism, while more recently Paul Wilkinson has challenged Sizer’s approach by focusing on and portraying dispensationalists during this period in a far more positive light. For some pro-Israel Evangelicals, efforts by several senior nineteenth century British politicians to create the conditions necessary to secure a Jewish homeland are perceived as an historical `Cyrus moment’ whereby God utilised a secular power to restore his people to their covenantal and ancestral homeland. Dan Cohen-Sherbok’s book likewise explores how Christian Zionists helped establish a Jewish homeland, drawing strongly upon Sizer’s research (which he acknowledges at the outset). Yet whereas Sizer’s polemical (and unnecessarily pejorative) approach is aimed at an Evangelical audience divided over its response to modern Israel, for the most part Cohn-Sherbok offers his readers a more dispassionate and objective appraisal. As such, the historical narrative which unfolds during the first three-quarters of his book is permitted to speak for itself, without constant recourse to criticism of the main actors, thus making it all the more readable and compelling. This is possibly because he sets out to demonstrate how Zionist thinking was central both to emerging and also mainstream, historic British nineteenth-century Christianity, unlike Sizer who arguably portrays early Christian Zionists as a minority on the fringes of orthodoxy. Nonetheless, there are structural issues concerning how some of the book’s material is presented. For example, the bulk of Cohn-Sherbok’s narrative gives almost equal time to Jewish religious and secular Zionism, rather than focusing on Christian Zionism alone. Clearly, both Zionist camps overlapped to a degree, drawing upon and mutually exploiting each other’s agenda to further their own. Nonetheless, Cohn-Sherbok’s title and stated aim is somewhat misleading as the book does not focus wholly upon Christian Zionism. Moreover, the compelling narrative which unfolds during the first 150 pages or so of Cohn-Sherbok’s book shifts abruptly in the last quarter of the book, suddenly exploring Christian Zionist influences upon Washington’s foreign policy. Particularly noteworthy is how Cohn-Sherbok quotes lengthily from pre-tribulationist Tim Layhaye’s Left Behind books, a dispensationalist Christian fiction series set in an end-times seven year tribulation period which commences after the Church has been raptured, or caught up to heaven. It is quite one thing to discuss how LaHaye’s books were bestsellers that sold millions of copies in the U.S., but it is quite another to extrapolate from this the thesis that Evangelical dispensationalism therefore lies at the heart of U.S. politics and foreign policy. Indeed, British Christianity indirectly helped create the State of Israel, while its North American counterpart contributed (and continues to do so) towards sustaining it. But contrary to popular European opinion, North American Evangelicalism is far from homogenous, and while it is true that many Christians in the U.S. lend strong support to modern Israel, this is not necessarily borne out of a dispensationalist influence upon U.S. politics. Consider, for example, how post-Holocaust theology has contributed to expressions of support for Israel from across Christendom ever since the State of Israel was founded in 1948. Cohn-Sherbok’s structure suggests he may have drawn on earlier material (he previously cooperated on a project exploring the Arab-Israeli conflict) as a basis for the main thrust of this particular book. The result is an objective and impassionate 150 pages, together with a final quarter of the book which arguably comes across as somewhat of a tirade against what he perceives as a dangerous Christian Zionist mindset which wields substantial influence within U.S. politics. This is a pity because, on the whole, the bulk of this book offers a genuinely fascinating narrative exploring many of the behind-the-scenes political efforts which ultimately led to the founding of a Jewish homeland and nation. Thus, despite any minor shortcomings the book remains an inherently valuable introduction to both early Jewish and Christian Zionism.